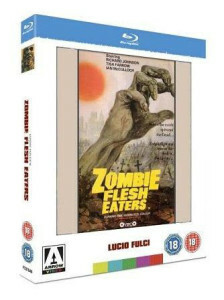 Notorious for being banned in the UK for many years as a ‘Video Nasty’ Zombi 2 a.k.a Zombie and Zombie Flesheaters brought Italian director Lucio Fulci world cult status. 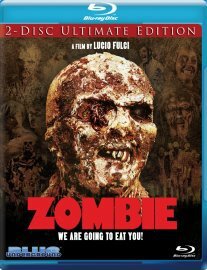 Although it’s sequels dissipated into dust Zombie found a following on grainy VHS and DVD plagued problems on its varying editions. US company Blue Underground have released a new all singing and dancing Blu- ray edition. The two discs are a little marketing ploy but that said what they contain is zombie horror priceless, especially if you’re a fan. However, UK company, Arrow’s 2 disc Blu-ray offering is even better with arguably as good extras. After the loss of her mother, medical student Nancy Adams travels to a secluded beach. Hitting the waves Nancy finds herself being stalked by a great white shark. With a broken surf board lying near by a young boy finds a Go-Pro helmet cam and we get to see a recording of how its owner met their demise. We’re then introduced to Nancy Adams (Blake Lively) bouncing around in a vehicle in the middle of nowhere, with the feeling we’re in a torture tourist film. However, thankfully this is a killer shark film. Interestingly, director Jaume Collet-Serra (Orphan, Unknown) quirkily shows her social media texts and photos as a wipes on screen. Played by Óscar Jaenada , Carlos the broken English local (who does not kill Nancy) drops the surf board touting tourist off safely at the beach. The perfect body, on the perfect beach, with the most perfect waves and scenery sets up a false sense of security. It’s not long before Nancy encounters some surfers who warn her of a strong current and rocks. It not just abs, bikini and cleavage. Surfing film fans may find the first minutes particularly interesting, its wonderfully shot as they surf the waves off the beautiful beach. In addition Collet-Serra makes full use of the unorthodox novel way (breaking the fourth-ish wall) of the videophone calls and watch face projection on screen. These shots set up the family dynamics, back-story and elapsing time to hold attention and keep momentum. The proceedings are enhanced by Marco Beltrami’s (World War Z, The Thing 2011) score. But this is all inconsequential as deep down you’re waiting for the shark to strike. After a dolphin appears to break things up with a jump scare, Collet-Serra is wise to get to the great white quite quickly with an excellent shot of the sharks silhouette through a huge wave hot on Nancy’s heels like something from a Steve Alten novel. When the water turns red – the survival story beings. The Shallows doesn’t present great shakes in term of story, it’s a basic don’t get eaten tale reminiscent of Open Water (2003) and The Reef (2010), person verse nature. 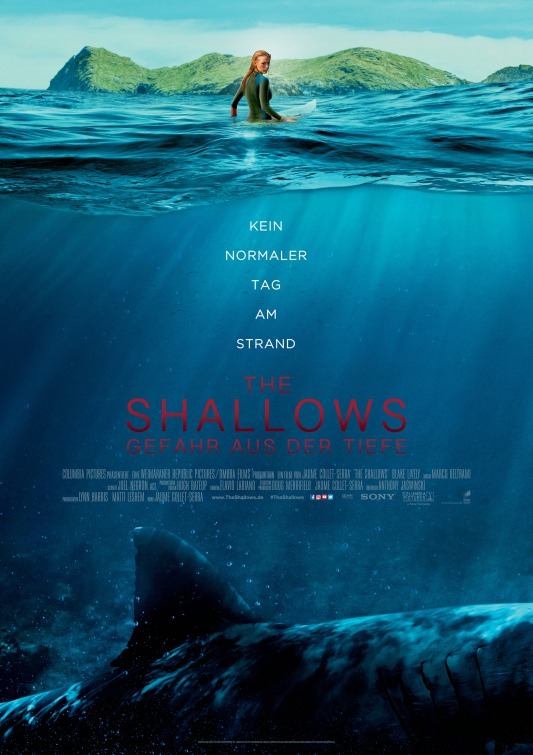 The Shallows offers big budget set ups and thrills with a whale carcass and buoy being bashed by the great white, the effects, bruises and bite makeup are finely done, there’s also plenty of blood, severed limbs and bites on display. There’s a solid performance from Blake Lively who is focal throughout. But the star of the show is the shark, when it breaks the water it’s exceptionally realised, it feels and looks for the most part scarily real. This is not a Syfy channel special effect, this great white is unnerving and frightening. There are calm before the storm moments where Lively’s Nancy befriends a seagull, tends to her wounds, talks to herself, the night time shots are particularly eerie as she silently stalked. Inevitably each chance of rescue is thwarted by the tenacious killer. With a handful of shark attacks littered throughout there’s enough moments to maintain interest. Dehydrated, no food and losing blood writer Anthony Jaswinski’s offers part an endurance test story as well as a creature feature. As Nancy goes from salvation points, through the salt water, rock to rock, there’s plenty of tension as she times her swims in an attempt to out manoeuvre the shark. The slick editing and Jaswinski’s story brings the film full circle playing against expectations and with sleight of hand you’re into the unknown, with Nancy’s fate up for grabs in the closing act where she faces off with the extremely aggressive predator. With high-tides, jelly fish stings, storms closing in, flare guns, Collet-Serra keeps the thrills coming until the end. Refreshingly it doesn’t rehash Jaws. Shark fans will no doubt get an uneasy and unsettled kick out of some of the elaborate stunt setups. With its small cast, excellent lead, beautiful location cinematography, if you’re into stranded shark films you can’t go wrong. Overall, a fast paced, grounded shark attack film and a recommend bite of entertainment. Six Companions – a dwarf, half-elf, warrior, mage, knight and kender reunite amid rumours of war and growing evil, horrors that will either destroy them or forge them into heroes of the world of Krynn. 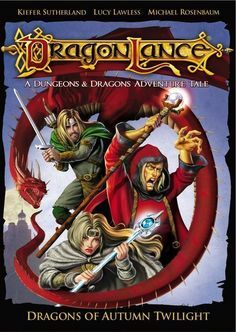 It’s a Dungeon &amp; Dragons tale even with the wealth of Dragonlance’s source material that I know is out there from Margaret Weis and Tracy Hickman, George Strayton’s screenplay is quite skimming. At times it’s naturally reminiscent to Lord of the Rings with orcs, Elves, Dwarfs, dragon and Wizards. The story beats echo Conan the Destroyer and Krull, I must admit I’ve never read first novel for the campaign setting on which it is based, given it was made in 2008 it feels very cheap where as the ’80s Dungeons &amp; Dragons cartoon still holds up and fares much better as a piece of entertainment. As the Companions flee, struggle against enemy forces, escape, and encounter undead warriors despite Meugniot’s best efforts it feels quite flat which is a shame given some of the character designs are visually interesting. It has all the right fantasy elements however, the animation shortfalls takes you out of the moment dulling any danger and excitement. Overall, it never reaches the heights or atmosphere of the comparable D&amp;D series, Fire and Ice or Gauntlet the video game. Frustrated with babysitting on yet another weekend night, a selfish teenager summons Goblins to take her baby half brother. She is then given 13 hours to solve a labyrinth and rescue him from a Goblin King before he is lost forever. Even though it was met with mixed reviews nearly thirty years later it still manages to charm and retain a cult following. As a boy I remember watching Jim Henson’s feature in a darkened cinema, being scared by the Goblins in Toby’s room and the Firey gang intimidating Sarah. The Final Version is the third book I’ve had published; my first was a zombie chiller and the second was a vampire horror novel, and was better received reaching #13 in the fantasy horror chart. 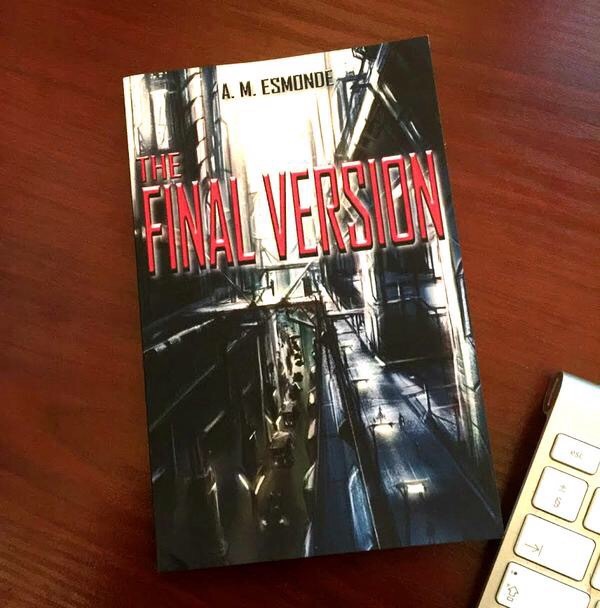 The Final Version is the first novel I draft, even though released third. I, who never in the first 30 odd years of my life, ever imagined would write one word for publication. I never could have predicted it would reach #12 in the charts. 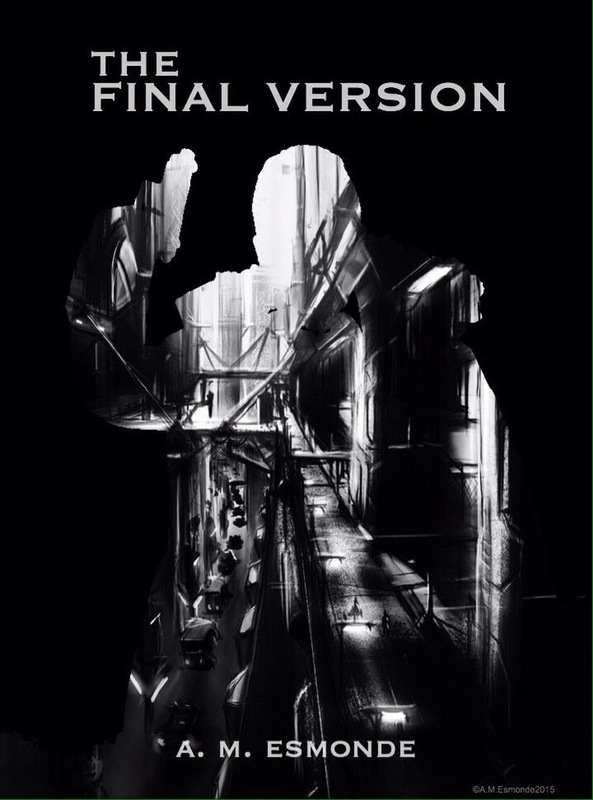 Yesterday, while prepping my next novel Darkest Moons (out October 2016) I looked over The Final Version digital eBook edition which is available is on Amazon (shameless plug). After rereading some of it was one of the strangest experiences of my life. I didn’t recognise half of what I’d written. Had no recollection of writing it. “Where did those words come from?” I questioned. “Who did they come from?” All I can figure is I went into some kind of writer’s trance. There’s a Bladerunner feel, but a plastic and neon one in and in contrast to crowded over population there’s an emptiness, loneliness where people have buildings to themselves and go about there business under big brother’s eye. The suburbs are different again, policed ravaged and dangerous. But what came out is something that makes me laugh today after UKs decision to leave the EU because of the way the political landscape in the World especially the shift in UK and USA, which echoes in the subtext of the novel’s backdrop. The Final Version, centres around a hearty mix of cyberpunk, DNA, A.I. Robots and Cloning, but its also a post war story of sorts, a warning if you like – which I hope doesn’t come to pass. Where the elite chose not to revive their fellow people (in cryo status), to keep power and resource across the remaining cities to themselves. Of course there’s assassinations, conspiracy, but never more has a piece of fiction I’ve written become a step closer to reality not just with DNA, advancements in technology and transatlantic travel but the blurred warped political agendas and unity of humankind. For less than a coffee check out the future… Are you unique or simply the final version? Disillusioned and bored with his job a Las Vegas officer’s attention is brought to a large bail amount paid in cash, this leads him to a purpose built safe room that with the help of his employee they decide to steal the content. 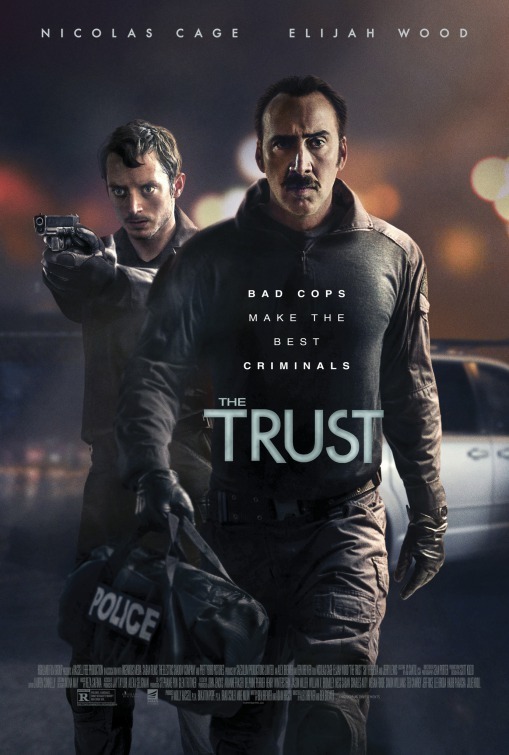 Directed by Alex Brewer’s The Trust, I’ll say this up front, works thankfully due to some smart casting. Nicolas Cage’s performance as Jim Stone is a return to form. Stone is a witty, wacky, intelligent officer who seemingly goes by the book but reaches point where he doesn’t want to end up like his dad (Jerry Lewis). Lewis’ very brief cameo is a pivotal role, in as much as it set the stage for Stone’s motivation. Cage’s nihilistic Stone screws the tension tight, at times defusing it with quips at Waters’ (Elijah Wood) heart pounding expense. Wood’s washed out character with a conscious Waters is swept along as the two Evidence Management unit officers, fed up with trying to make ends meet plan a heist. The film opens with Waters banging a prostitute and later deliberating how much money to leave. Don’t expect the bright lights glitz of the Vegas Strip to feature too much, there’s none of the stereotype Vegas gambling, shows or sharp suits in the film. The film has a Training Day grit, the robbery they plan is in a run down apartment in the seedier neighbourhood outskirts. Writer’s Ben Brewer and Adam Hirsch feed Cage and Wood some great lines which they delivers perfectly. The Trust offers partly a ‘day in the life of’ type of feel, with a couple of shoot outs. Brewer’s on location shoot adds the principles fine performances and Reza Safinia’s music adds to the fun. Ultimately, if the leads were played by anyone else The Trust may have fallen into obscurity, its Cage’s demeanour and Wood’s portrayal that really hold it together as the twist kidnapping ending, while well staged, is somewhat anticlimactic especially in comparison to the entertaining first half where Waters goes on stakeouts and Stone goes to work undercover at Vegas hotel making more money on tips than he does as a police officer. There’s also an amusing scene where Stone sporting an awful German accent tries to purchase a diamond tipped drill from Europe over the phone using a translation book. Overall, it’s a well made film even if the climax is disappointing. Its worth checking out just to see the chemistry between the two leads and Nicolas Cage breaking out of Video on Demand/straight to DVD hell, back to cinematic form thanks to Brewer’s direction. Lorraine wanting to retire from the spiritual field and Ed Warren tired of justifying what they do travel to north London to help a family plagued by a malicious spirit. Opening with a chilling medium session at the notorious Amityville home, where Lorraine Warren (Vera Farmiga) has an encounter with the dead Lutz family and a demon nun, director James Wan hits the horror road running. The creepy nun from Ed’s (Patrick Wilson) painting an omen of death later turns up at Ed and Lorraine’s home and we’re introduced to their teenage daughter. Meanwhile, a single mother raising four children are harassed by the previous deceased occupant. With a fistful of writers and the sharp editor, Wan creates a good build up, fleeting between the US and UK and although it takes its time getting Ed and Lorraine to the English house, it works giving the film scope. The cast particularly the child actors are great and Farmiga shines. Wilson delivers another great performance as the matter of fact Ed. Incidentally as well as being a handy man, he also does a good acoustic rendition of Elvis’ “Can’t Help Falling in Love”. The notable German actress Franka Potente also appears as a sceptic but gets very little screen time. Simon McBurney is solid and almost equals Timothy Spall’s performance as Maurice Grosse. Like its predecessor it shares much with other haunting films but it stands on its own due to Wan’s execution, he knows horror, the eeriness, atmosphere, timing of visuals and sound to get hairs standing on end effortlessly. Something which the rushed Annabelle (2014) arguably lacked in his absence as director. With a pause for thought, like true crime murders, it gets under your skin and you can’t help feel that someone is profiting from someone else’s misery. Conscious aside, true or not, Wan stays close to the Enfield Haunting’s beats with plenty of artistic licence to inject enough practical and CGI effects without it losing its grounded feel too much in the first three quarters. From wall posters to wallpapers, clothes and cars the 1977 is recreated almost perfectly. There is a set up with a remote control, although I don’t recall there being remotes like that in Great Britain, or at least the family surely wouldn’t have been able to afford that TV, in any case, the set up is still effectively creepy with a great jump scare when the young girl encounters an old man in both a reflection and face to face. As well as a scary zoetrope toy and fire engine, there’s a horrific moment where the girls young brother is tricked into thinking a ghoul is a dog wanting to go out by ringing a bell next to the door. The UK terraced neighbour setting sets it apart, but naturally its reminiscent of the three part The Enfield Haunting (2015) and When the Lights Went Out (2012) which told the 1974 Black Monk of Pontefract story. Nevertheless, Wan to his credit recreates the Brit 70s injecting some nostalgia for the viewer, with the location, The Jam, TV clips of the day and so on. Wan packs the Conjuring 2 with energy, jumps scares and handles the emotional scenes delicately. In the closing act there’s a twist as it tries to hone The Exorcist. While it may not have the grit and weight of the aforementioned, it has an entertaining mix of drama and horror to set it apart from many others. As Ed and Lorraine do battle at the end, Ed stops the young girl falling to her death as Lorraine word duels with the demon (akin to the design of 2005’s The Nun/La Monja), yes there’s an unnecessary wash of practical and computer imagery in the finale but it comes back to earth with an eerie text epilogue, then the couple add the zoetrope toy to their collection which is followed by the leads bursting with chesmisty dancing happily together. With Ouija boards, spooky nuns, spectres, toys, moving furniture, ghosts, demonic voices and so on you can’t go wrong. Excellent mainstream horror entertainment. A young Chicago couple Ben and Annie return to Annie’s small North Carolina hometown, bumping into some of her old friends they embark on an impromptu Bigfoot hunt which threatens their relationship and lives. I love a good Bigfoot film, the ones though with blood and guts, there’s been a spate of the recently, like shark films and creature features they’re a minefield in terms of quality ranging from Eduardo Sánchez’s Exists to (Syfy, enough said) Bigfoot. Director Dan Riesser’s Stomping Ground, is a low budget surprisingly good traditionally shot Bigfoot film. While the camera work is a little rough in places, it benefits from an on location shoot. To drum up the film’s saleability to horror hounds Evil Dead’s Theresa Tilly appears very briefly. We get some dead bodies, a severed finger, a severed head and a pretty good Bigfoot costume (no rubbish CGI, hooray). John Bobek’s city boy Ben and Tarah DeSpain’s Annie are strong enough to carry the film as their relationship is tested. For a low budget film the acting excels. Jeramy Blackford, is notable as Paul and gives performance (akin to Eric Balfour’s Brad in Blackfoot Trail killer bear feature) as Annie’s former boyfriend, which prompts some tension between him and Ben. Justin Giddings is amusing enough and plays local Bigfoot expert Jed. J. Michael Radtke’s visual Bigfoot effects work better from behind and in the shadows, with the bright showdown stealing some impact and effect. There’s the expected Deliverance jokes and references to Wrong Turn, writers Riesser and Andrew Genser’s script works best when it avoiding pop culture references, to their credit they give Annie enough back-story throughout without dropping everything in the first five minutes and the knocking, den building, hair and calls remind you it’s a Bigfoot film. The extremely long build up struggles to hold attention with the Bigfoot segments coming late in the latter half of the third act. The ego-stroking, chest-beating competition between Ben and Paul gets a little repetitive objectifying Annie. Stomping Ground is more interesting when they’re talking about local history, drinking moonshine, playing games and being attacked. At 80 minutes it feels longer than it is, tonally Riesser’s offering doesn’t hold up comedy wise to be another Tucker and Dale versus Evil, there’s also not enough Sasquatch focus and gory action set-ups to fully satisfy horror fans. That said, it’s a commendable independent film effort and certainly worth checking out especially if you’re a Bigfoot lover. I’m fond of Jaws the Revenge, there I admit it. Although it may be a bad movie, also an incompetent one, to its credit it ignores Jaws 3- D and stars Lorraine Gary of Jaws and Jaws 2. Yes, Ellen Brody returns, the wife of chief Martin Brody. Director Joseph Sargent opening is probably the strongest segment of the film. We return to an atmospheric Martha’s Vineyard but this time it’s Christmas time where Ellen’s youngest son has his dad’s old job and after a call is eaten by a shark while a choir drowns out his screams. There’s some good to come out of this event as we get some cameos at the funeral by the actors of the original. Grief stricken Ellen flees the Bahamas to stay with her eldest son Michael played by Lance Guest (of fricking Starfighter) – but, get this, the shark has somehow followed her, it wants to eat her entire family possibly as revenge for its parent sharks being killed by Brody in part one and two, who knows?! 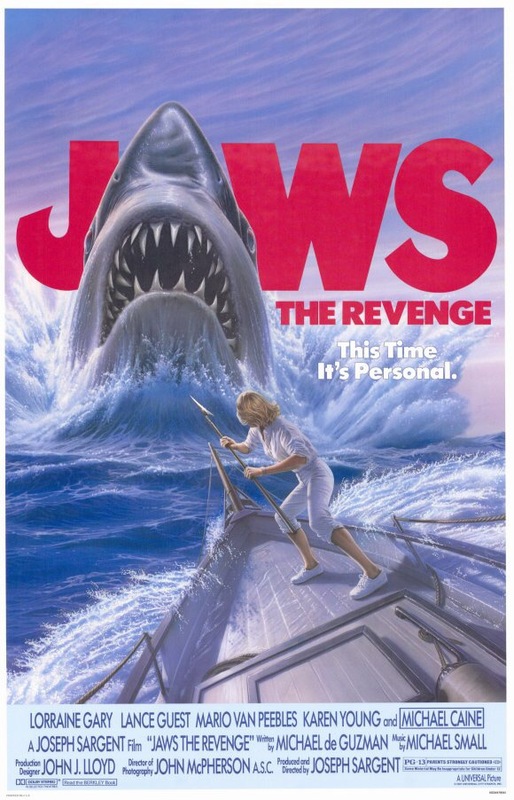 Yes it’s a paper thin plot with a series of shark attacks but if you can look beyond that and the shoddy shark models there’s something quite endearing about 1987’s Jaws: The Revenge. At the time criticized for its jumping shark (no Henry Winkler pun intended) it has since been established that sharks in fact do propel themselves out of the water (although in the critic’s defence I’m sure the filmmaker had no idea of their over 15 feet leaps at the time). That said, to date no shark has been heard roaring like Bruce 4 does in this film. Guest’s performance is excellent, he really is likable (honestly) as the marine biologist and over protective son. Mario Van Peebles’ Jake with a terrible accent and an unlikable attitude makes you secretly glad he gets eaten, depending on which version you watched, you still feel sorry for his wife. There’s a handful of imaginative scenes which makes this instalment worthwhile. At one point Jake attaches a device to the shark so that he can track it through its heartbeat. These heart beat noises build up some tension akin to the barrels in the 1975 Jaws. Interestingly, there’s set up where Michael is chased through a wreck and escapes using his air tank – James Bond style! In addition there’s also banana boat scene where Jaws (Bruce 4) tries to chow down on Ellen’s granddaughter. Another positive is that Gary really shines as the credible paranoid grandmother and mother. It’s refreshing to see (albeit cringe worthy) the older lady falling in love with a local pilot Hoagie (Michael ‘Get Carter’ Caine). Oddly writer Michael de Guzman injects an overbearing amount of sexual dialogue. With every adult character in the film acting at times like a frisky teenager under Sargent’s supervision. For tradition and impact Sargent wisely uses John Williams classic theme and unsurprisingly Michael Small fills in the rest delivering a near on perfect score. In the closing Caine’s Hoagie is so Dirty Rotten Scoundrels cool he crash-lands his aeroplane in to the sea and when he emerges onto the boat he’s completely dry, “Blood ‘ell, the breath on that thing”. So long as you’re watching the version where Jake dies and shark gets stabbed, sinking breaking the boat up and not the one where Jaws inexplicably explodes (recycling footage from the original Jaws) it’s a more fitting closure. Either way both versions are choppily edited and you can’t help feel that with more care or a different director even with the preposterous, yet, novel premise it could have been better. Overall, hugely flawed but somewhat entertaining. On a family holiday at the Grand Canyon a young boy with autism takes five black pebbles marked with symbols. These stones belonged to the Anasazi tribe and by removing them he inadvertently releases supernatural forces into his home. 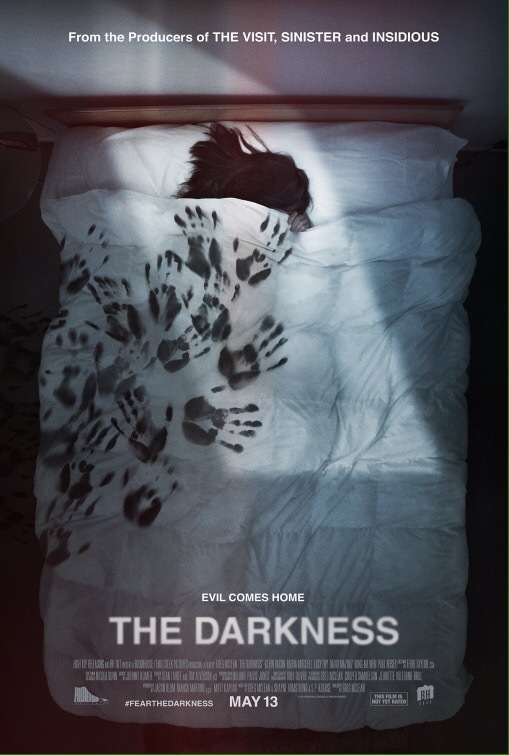 Not to be confused with Jaume Balagueró’s Darkness (2002) talented director/writer Greg McLean of sleeper hit film Wolf Creek and underrated killer croc flick Rogue offers a supernatural horror in the vein of Poltergeist and Amityville Horror including their remakes. What really works in McLean’s favour is the Taylor family is not made-up of the stereo type character models synonymous with the genre. No stranger to mainstream horror Kevin Bacon returns to genre looking fittingly pasty and washed out as a former philandering workaholic father Peter who is determined to change his ways. Incidentally, his wife Bronny effortless played by the excellent Australian actress Radha Mitchell is a recovering alcoholic mum. To add to their rocky relationship, their son Mikey is autistic and their teenage daughter Stephanie is bulimic. The cast deliver the obvious challenges as well as underlying pressures of the family dynamics. Worthy of note is Lucy Fry’s Stephanie Taylor, the actress really portrays the teen angst and hysteria convincingly. Trian Long-Smith’s Sammy Levin, the savvy, bright intern leaves an impression but is sorely underused possibly to avoid clichés with Bacon’s Peter. Also writers McLean, Shayne Armstrong and Shane Krause effectively unfold some plot points, from Bronny’s alcoholism to Peter’s self obsessed boss Simon Richards played (notably) by Paul Reiser. Although a functional role, he gives background to Peter as well as moving the story forward with regards to his own family history. The derivative setting of American wealthy suburbia is eye-rolling. Yet, you kind of get the impression that Australia’s McLean, Armstrong and Shane Krause intended this to possibly be set in Uluru (formerly Ayers Rock) rather than the Grand Canyon, maybe to appease producers. Also there’s a choppiness that suggests there was another cut. As it plays out McLean offers, taps inexplicably turning on and doors closing by themselves. There are shadows in the background, demonic shapes in photos. The demons with animal headdress are creepy enough along with a few jump scares including a dream sequence with a wolf and a nasty dog attack. Johnny Klimek’s music is particularly notable with it tribal-like beats and the sound design peaks when spiritual healing Hispanic women Teresa and granddaughter Gloria (salient Ilza Rosario) try to ‘cleanse’ the home Tangina Barrons’ (Zelda Rubinstein) style. The corresponding mystical stone pebbles to each animal, wolf, snake, dog, crow, cow to their five un-rested spirits (with excellent earthy costumes) which the Anasazi tribe used to keep them at bay is an interesting element but like the family set-up there’s little pay- off apart from lessons – 1. A family should stick together no matter what 2. Don’t remove items from an ancient cave or you’ll unleash vicious demons that will break up your family, take your child or send you mad. To McLean’s credit we get to see each animal practically (rather than CGI) but disappointingly we never get to see the bull. Thankfully an attack on Mikey’s grandmother’s cat tastefully takes place off screen. Considering this feature is based on a true story that was relayed to McLean the build up follows all the usual horror tropes, things going bump in the night, investigating the cause, calling in the spiritual help and so on. There’s even Exorcist homages with noises in the attic and Mikey’s Mr Howdy-like imaginary friend Jenny. As the story develops the special effects also increase. While the portals, shadows, black hand prints and swirling clouds are finely executed as with many paranormal horrors the effects driven closing undermine the grounded set up. Instead of CGI for CGI’s sake it may have worked in its favour for the family to physically race to return the stones. In true late 70s and 80’s style during the end credits there’s a shot leaving it open for a follow up or putting it to rest. Either way while it doesn’t tread any new ground in terms of supernatural horror, those unfamiliar with the aforementioned supernatural films will certainly get a kick out of this and for old hats there’s the alternative family set-up. That said, given McLean’s creativity and originality with previous works this has too many moments of déjà vu and not enough scares to give The Darkness its own legs despite the well developed family drama foundation. Overall, worth checking out if only for the performances and demon costume design.